Four Illness-Related Quarantined Passenger Planes In Three Days – Coincidence? In the past three days, four passenger planes (three in the USA, one in France) were quarantined for a short period of time with multiple passengers complaining about sickness symptoms causing a virus scare in the cities where they landed. Coincidence? We’ll let you decide. Here are the facts. 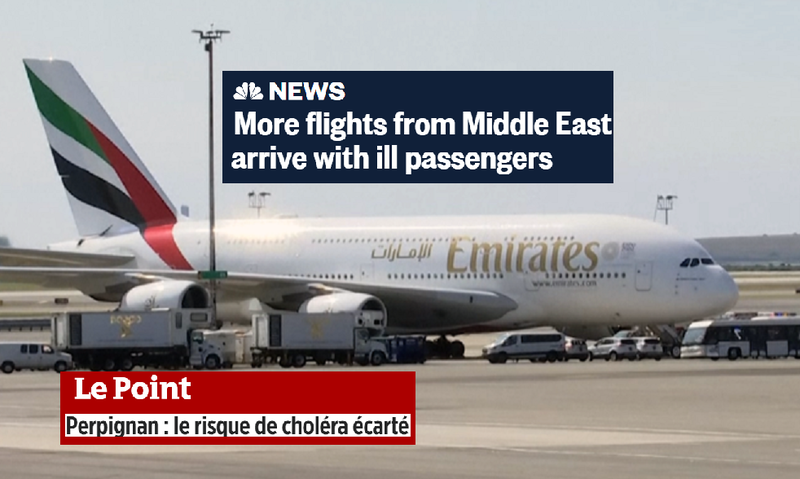 A plane arriving from Oran, a major city in Algeria was stopped upon landing in Perpignan, in the south of France, after the captain informed authorities on the ground that there was a possible case of cholera on board. All 136 passengers were retained on the plane for an hour and subsequently released. Algeria has been battling outbreaks of cholera in the past month. A flight from Dubai was quarantined for hours at John F. Kennedy International Airport Wednesday after some 100 people on board complained of unknown illnesses. The majority of the ‘sick passengers’ were afterwards diagnosed with “common viruses such as influenza and the common cold,” according to New York City's Health Department. Airline Emirates, realizing the damning PR, at first said in a statement Wednesday that only 10 individuals, three passengers and seven crew members, were taken to a hospital for medical care and evaluation. On Thursday 6 September, the CDC announced that 11 people had been transported to a hospital. The rest of the passengers were later released after evaluations. In Philadelphia airport, passengers traveling back from Saudi Arabia on American Airlines flight 755 from Paris and, subsequently, American Airlines flight 717 from Munich, were checked for illness (the travellers in question hade come back from Mecca where they had participated in the Hajj, or annual Islamic pilgrimage. In the end, twelve passengers on board those two planes were referred to medical professionals after exhibiting flu-like symptoms on their flight. Of course, one could conclude that it all occurred with passengers travelling from mostly Islamic countries arriving in the West this week, but any website suggesting as much would be considered to have an ulterior motive of course. Glad it wasn’t me saying that. maybe a test run of biological weapons, just to see how successful it would be with a cholera virus. Then use something a little stronger like anthrax or Smallpox to start a pandemic in the targeted nation say the EU or USA. I agree with the 2 previous comments as I feel the “deep state” is against the ropes and they are probably testing their final solution in case their “blue wave” looks more like a crimson one. IMHO they would rather see the whole world burn than loose their last grip on power. If 1/2 of the crumbs we have been fed over the years are true and proven, it will be so disturbing and sick the only way out is to make a world wide distraction that brings humanity to its knees.